An adaptable rectangular Worldwide Homefurnishings Inc. ottoman that can provide seating or a footrest. A beautiful ottoman that keeps your seating area tidy. Use this easily portable ottoman when you need a footrest or an extra seat for guests. 19.75"H x 23"W x 46.75"L, 53 lb. Now you can sit back, relax and rest your feet with this sophisticated contemporary ottoman. Made from top class polyester foam that offers medium seat firmness, this square fabric ottoman features a superior quality stainless steel base construction, with a carefully polished finish. What's more, you will love our unique multi-tonal textured fabric upholstery that reflects your swanky style. Use this ottoman in your living room by the sofa, for your makeup at a dressing table, or just as extra seating in the living room. Bring timeless class to your space with this sleek modern upholstered cocktail ottoman that has an enhanced modern look. The legs are matte black metal, giving the whole piece a simple but elegant look. With a multi-toned fabric upholstery and horizontal tufting, this ottoman creates a warm and inviting ambience. It is perfect for formal or casual living spaces place a tray on top to hold your cocktail and put your feet up and relax! Enjoy this decorative multi-functional ottoman from CorLiving. Upholstered in silver grey velvet fabric the LAD-134-O is a 3 practical solution for many areas in your home. Features a comfortable foam padded upholstered top surface finished with top stitched edge seams and stylish tufting. 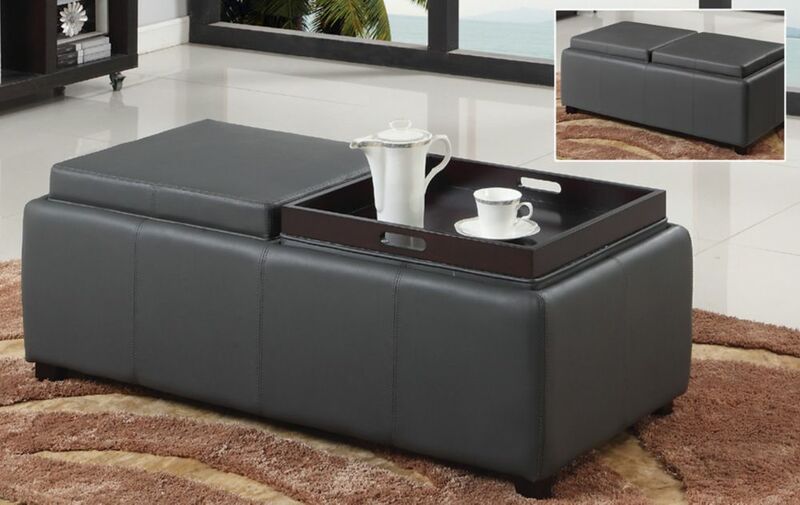 This coffee table/ottoman opens for plenty of additional storage space. A great accent piece in any living space. Give your little ones a comfy place to sit and rest their feet with this fun sized 2 piece ottoman set. Upholstered in a grey easy care material, clean up has never been so simple! A great addition to story time, these ottomans provide extra seating while adding a touch of modern flair to any bedroom or playroom. Comfortably padded and built to last, these ottomans are a must have for any child. Manhattan II 23-inch x 20-inch x 47-inch Faux Leather Ottoman in Grey An adaptable rectangular Worldwide Homefurnishings Inc. ottoman that can provide seating or a footrest. A beautiful ottoman that keeps your seating area tidy. Use this easily portable ottoman when you need a footrest or an extra seat for guests.